Why is Windows in decline today? Short answer: because Microsoft lost out and/or gave up on Windows Phone / Mobile. But how did it get to that point? A significant part of the story is the failure of Longhorn (when two to three years of Windows development was wasted in a big reset), and the failure of Windows 8. In fact these two things are related. Here’s a post from Justin Chase; it is from back in May but only caught my attention when Jose Fajardo put it on Twitter. Chase was a software engineer at Microsoft between 2008 and 2014. Chase notes that Internet Explorer (IE) stagnated because many of the developers working on it switched over to work on Windows Presentation Foundation, one of the “three pillars” of Longhorn. I can corroborate this to the extent that I recall a conversation with a senior Microsoft executive at Tech Ed Europe, in pre-Longhorn days, when I asked why not much was happening with IE. He said that the future lay in rich internet-connected applications rather than browser applications. Insightful perhaps, if you look at mobile apps today, but no doubt Microsoft also had in mind locking people into Windows. WPF, based on .NET and DirectX, was intended to be used for the entire Windows shell in Longhorn. It was too slow, memory hungry, and buggy, eventually leading to the Longhorn reset. That was a shame because Silverlight was a great bit of technology, lightweight, powerful, graphically rich, and even cross-platform to some extent. If Microsoft had given developers a consistent and largely compatible path from Silverlight to Windows Phone to Windows 8 to Windows 10, rather than the endless changes of direction that happened instead, its modern Windows development platform would be stronger. Perhaps, even, Windows Phone / Mobile would not have been abandoned; and we would not have to choose today between the Apple island and the ad-driven Android. The transition of Microsoft’s .NET platform from Windows-only to cross-platform (and open source) is the right thing. Along with Xamarin (.NET for mobile platforms), it means that developers with skills in C#, F# and Visual Basic can target new platforms, and that existing applications can with sufficient effort be migrated to Linux on the server or to mobile clients. That does not mean it is easy. Microsoft forked .NET to create .NET Core (it is only four years since I wrote up one of the early announcements on The Register) and the problem with forks is that you get divergence, making it harder to jump from one fork to the other. At first this was disguised. The idea was that .NET Framework (the old Windows-only .NET) would be evolved alongside .NET Core and new language features would apply to both, at least initially. In addition, ASP.NET Core (the web framework) runs on either .NET Framework or .NET Core. This is now changing. Microsoft has shifted its position so that .NET Framework is in near-maintenance mode and that new features come only to .NET Core. Last month, Microsoft’s Damian Edwards stated that ASP.NET Core will only run on .NET Core starting from 3.0, the next major version. Async streams, indexers and ranges all rely on new framework types that will be part of .NET Standard 2.1. As Immo describes in his post Announcing .NET Standard 2.1, .NET Core 3.0 as well as Xamarin, Unity and Mono will all implement .NET Standard 2.1, but .NET Framework 4.8 will not. This means that the types required to use these features won’t be available when you target C# 8.0 to .NET Framework 4.8. 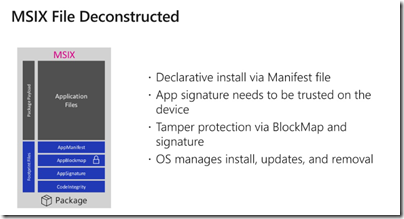 Default interface member implementations rely on new runtime enhancements, and we will not make those in the .NET Runtime 4.8 either. So this feature simply will not work on .NET Framework 4.8 and on older versions of .NET. The obvious answer is to switch to .NET Core. Microsoft is making this more feasible by supporting WPF and Windows Forms with .NET Core, on Windows only. Entity Framework 6 will also be supported. It is also likely that this will work on Windows 7 as well as Windows 10. This move will not be welcome to all developers. The servicing for .NET Framework is automatic, via Windows Update or on-premises equivalents, but for .NET Core requires developer attention. Inevitably some things will not work quite the same on .NET Core and for long-term stability it may be preferable to stay with .NET Framework. The more rapid release cycle of .NET Core is not necessarily a good thing if you prioritise reliability over new features. The problem though: from now on, .NET Framework will not evolve much. There are a few new things in .NET Framework 4.8, like high DPI support, Edge-based browser control, and better touch support. There are really minimal essential updates. In time, maintaining applications on .NET Framework will look like a mistake as application capabilities and performance fall behind. That means, if you are a .NET developer, .NET Core is in your future. I have been porting a C# application which uses an MDB database (the old Access/JET format) to one that uses SQLite. The process has been relatively smooth, but I encountered a few oddities. One is puzzling and is described by another user here. If you have a column that normally stores string values, but insert a string that happens to be numeric such as “12345”, then you get an invalid cast exception from the GetString method of the SQLite DataReader. The odd thing is that the GetFieldType method correctly returns String. You can overcome this by using GetValue and casting the result to a string, or calling GetString() on the result as in dr.GetValue().ToString(). Another strange one is date comparisons. In my case the application only stores dates, not times; but SQLite using the .NET provider stores the values as DateTime strings. The SQLite query engine returns false if you test whether “yyyy-mm-dd 00:00:00” is equal to “yyy-mm-dd”. The solution is to use the date function: date(datefield) = date(datevalue) works as you would expect. Alternatively you can test for a value between two dates, such as more than yesterday and less than tomorrow. Actually, SQLite will easily do 50,000 or more INSERT statements per second on an average desktop computer. But it will only do a few dozen transactions per second. Transaction speed is limited by the rotational speed of your disk drive. A transaction normally requires two complete rotations of the disk platter, which on a 7200RPM disk drive limits you to about 60 transactions per second. Without a transaction, a unit test that does a bulk insert, for example, took 3 minutes, versus 6 seconds for JET. Refactoring into several transactions reduced the SQLite time to 3 seconds, while JET went down to 5 seconds. When Microsoft first started talking about Roslyn, the .NET compiler platform, one of the features described was the ability to take some Visual Basic code and “paste as C#”, or vice versa. 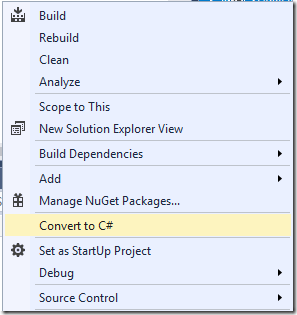 Some years later, I wondered how easy it is to convert a VB project to C# using Roslyn. 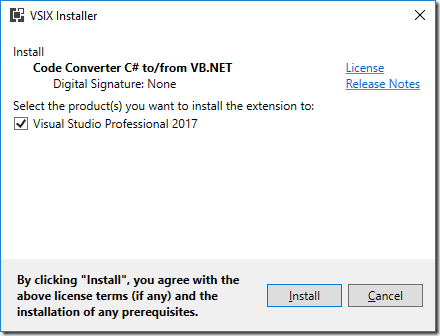 The SharpDevelop team has a nice tool for this, CodeConverter, which promises to “Convert code from C# to VB.NET and vice versa using Roslyn”. You can also find this on the Visual Studio marketplace. I installed it to try out. Note though that Visual Basic is still under active development and history suggests that your Windows VB.NET project will continue running almost forever (in IT terms that is). Even Visual Basic 6.0 applications still run, though you might find it convenient to keep an old version of Windows running for the IDE. Still, if converting a project is just a right-click in Visual Studio, you might as well do it, right? The tool makes use of the Microsoft.VisualBasic namespace to simplify the conversion. This namespace provides handy VB features like DateDiff, which calculates the difference between two dates. The generated project failed to set a reference to this assembly, generating lots of errors about unknown objects called Information, Strings and so on. This is quick to fix. Less good is that statements using this assembly tend to be more convoluted, making maintenance harder. You can often simplify the code and remove the reference; but of course you might introduce a bug with careless typing. It is probably a good idea to remove this dependency, but it is not a problem if you want the quickest possible port. 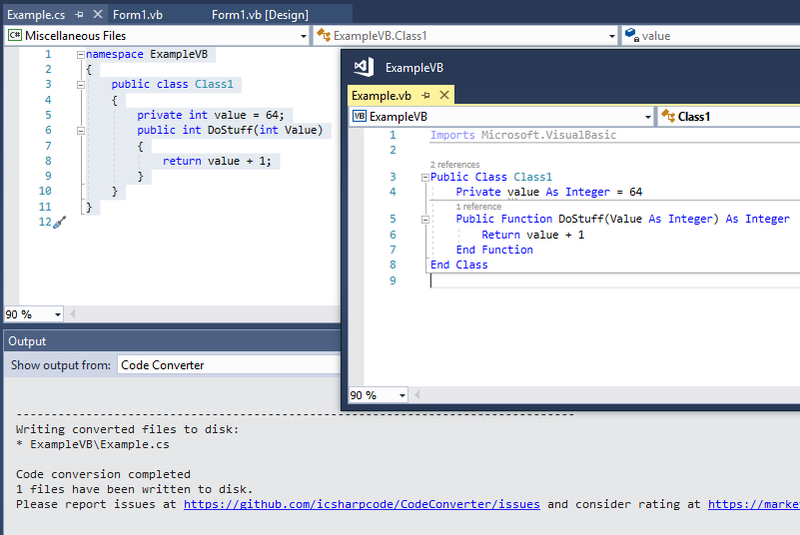 Here, the VB coder has used different case for a parameter and for referencing the parameter in the body of the method. Unfortunately another variable with the different case is also accessible. The VB code and the converted C# code both compile but return different results. Incidentally, the VB editor will work very hard to prevent you writing this code! However it does illustrate the kind of thing that can go wrong and similar issues can arise in less contrived cases. 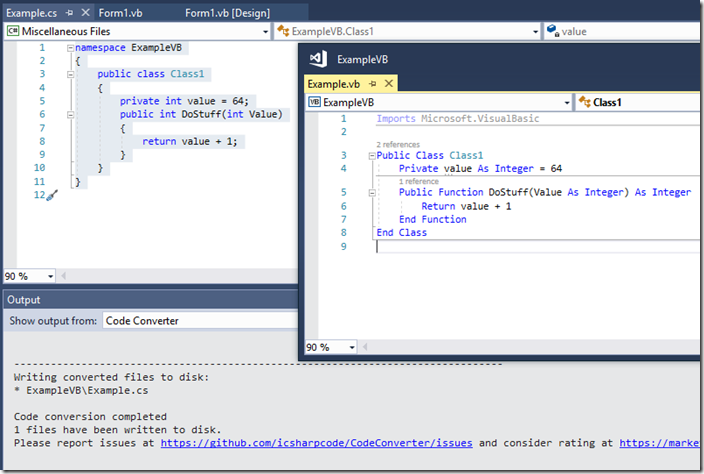 Another example is that in VB you can use an existing variable as the iteration variable, but in C# foreach you cannot. Collections often go wrong. In VB you use an Item property to access the members of a collection like a DataReader. In C# this is omitted, but the converter does not pick this up. Overloading sometimes goes wrong. The converter does not always successfully convert overloaded methods. Sometimes parameters get stripped away and a spurious new modifier is added. Bitwise operators are not correctly converted. VB allows indexed properties and properties with parameters. C# does not. The converter simply strips out the parameters so you need to fix this by hand. See https://stackoverflow.com/questions/2806894/why-c-sharp-doesnt-implement-indexed-properties if the language choices interest you. There is more, but the above gives some idea about why this kind of conversion may not be straightforward. It is probably true that the higher the standard of coding in the original project, the more straightforward the conversion is likely to be, the caveat being that more advanced language features are perhaps more likely to go wrong. Same code, different result, which can have unfortunate consequences. So is it worth it? It depends on the rationale. If you do not need cross-platform, it is doubtful. 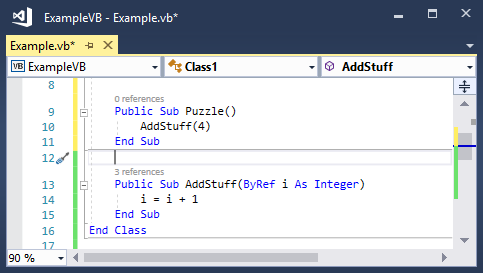 The VB code will continue to work fine, and you can always add C# projects to a VB solution if you want to write most new code in C#. If you do need to move outside Windows though, conversion is worthwhile, and automated conversion will save you a ton of manual work even if you have to fix up some errors. There are two things to bear in mind though. First, have lots of unit tests. Strange things can happen when you port from one language to another. Porting a project well covered by tests is much safer. Second, be prepared for lots of refactoring after the conversion. Aim to get rid of the Microsoft.VisualBasic dependency, and use the stricter standards of C# as an opportunity to improve the code. 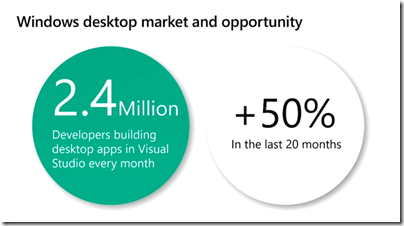 What is happening with desktop development on Windows and will WPF be upgraded at last? Once upon a time all Windows development was desktop development. Then there was web development, but that was a server thing. Then in October 2012 Windows 8 arrived, and it was all about full-screen, touch control and Store-delivered applications that were sandboxed and safe to run. Underneath this there was a new platform-within-a-platform called the Windows Runtime or WinRT (or sometimes Metro). Developing for Windows became a choice: new WinRT platform, or old-style desktop development, the latter remaining necessary if your application needed more features than were available in WinRT, or to run on Windows 7. Windows 8 failed and was replaced by Windows 10 (July 2015), in large part a return to the desktop. The Start menu returned, and each application again had a window. WinRT lived on though, now rebranded as UWP (Universal Windows Platform). 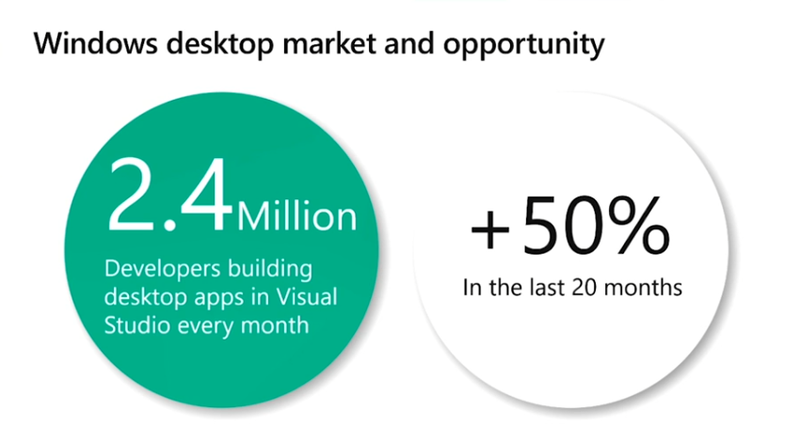 The big selling point was that your UWP app would run on phones, Xbox and HoloLens as well as PCs. It was still locked down, though less so, and still Store-delivered. Then Microsoft decided to abandon Windows Phone, a decision obvious to Microsoft-watchers in June 2015 when ex-Nokia CEO Stephen Elop left Microsoft, just before the launch of Windows 10, even though Windows Phone was not formally killed off until much later. UWP now had a rather small u (that is, not very universal). In addition, Microsoft decided that locking down UWP was not the way forward, and opened up more and more Windows APIs to the platform. The distinction between UWP and desktop applications was further blurred by Project Centennial, now known as Desktop Bridge, which lets you wrap desktop applications for Store delivery. Perhaps the whole WinRT/UWP thing was not such a good idea. A side-effect though of all the focus on UWP was that the old development frameworks, such as Windows Forms (WinForms) and Windows Presentation Foundation (WPF), received little attention – even though they were more widely used. Some Windows 10 APIs were only available in UWP, while other features only worked in WinForms or WPF, giving developers a difficult decision. The Build 2018 event, which was on last week in Seattle, was the moment Microsoft announced that it would endeavour to undo the damage by bringing UWP and desktop development together. “We’ve taken all the UI stacks and merged them together” said Mike Harsh and Scott Hunter in a session on “Modernizing desktop apps” (BRK3501 if you want to look it up). According to Harsh and Hunter, Windows desktop application development is increasing, despite the decline of the PC (note that this is hardly a neutral source). So what was actually announced? Here is a quick summary. Note that the announced features are for the most part applicable to future versions of Windows 10. As ever, Build is for the initial announcement. So features are subject to change and will not work yet, other than possibly in pre-release form. Greater information density in UWP applications. WinRT/UWP was originally designed for touch control, so with lots of white space. Most Windows users though have mouse and keyboard. The spacious UWP layout looked wrong on big desktop displays, and it made porting applications harder. The standard layout is getting less dense, and a new Compact Size, an application setting, will pack more information into the same space. More controls for UWP. New DataGrid, Forms with data validation, Menu bar, and coming in future, Status bar, tab controls and Ribbon. The idea is to make UWP more suitable for line-of-business applications, which accounts for a large part of Windows application development overall. New Windowing APIs for UWP. WinRT/UWP was designed for full-screen applications, not the popup-dialogs or floating windows possible in desktop applications. Those capabilities are coming though. We will get tool windows, light-dismiss windows (eg type and press Enter), and multiple windows on one thread so that they work like a single application when minimized or cycled through with alt-tab. Coming in future are topmost windows, modal windows, custom title bars, and maybe even MDI (Multiple Document Interface), though this last seems surprising since it is discouraged even in the desktop frameworks. What many developers will care about more though is new features coming to desktop applications. There are two big announcements. .NET Core 3.0 will support WinForms and WPF. 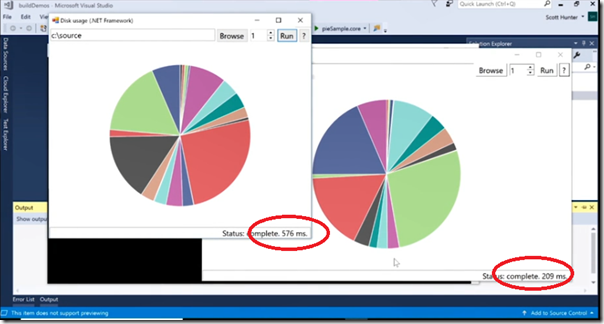 This is big news, partly because it performs better than the Windows-only .NET Framework, but more important, because it allows side-by-side deployment of the .NET runtime. Even better, a linker will let you deliver a .NET Core desktop application as a single executable with no dependencies. What performance gain? 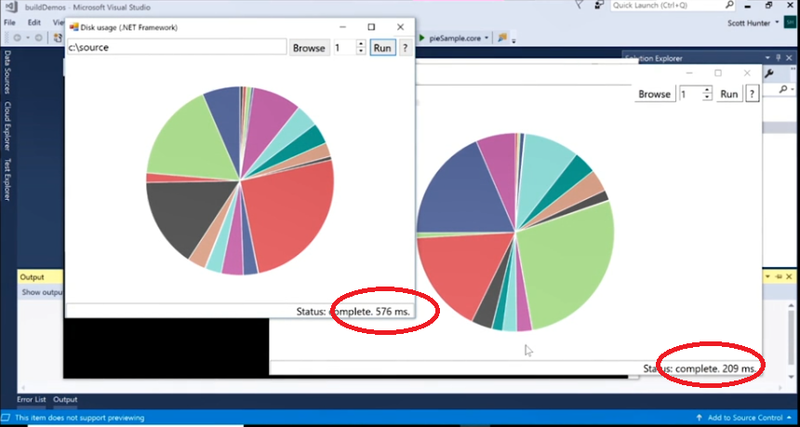 An example shown at Build was an application which uses File APIs running nearly three times faster on .NET Core 3.0. XAML Islands enabling UWP features in WinForms and WPF. The idea is that you can pop a UWP host control in your WinForms or WPF application, and show UWP content there. 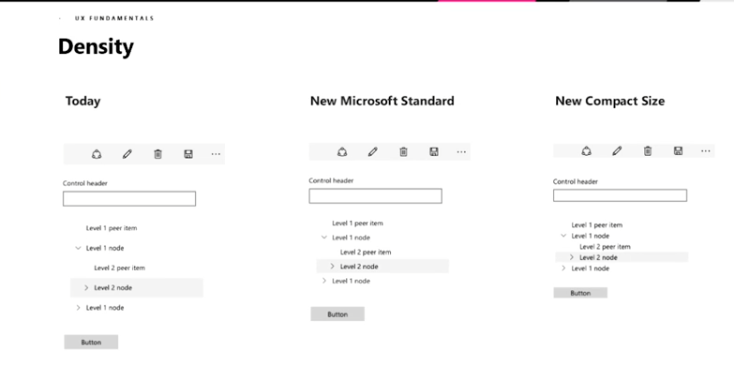 Microsoft is also preparing wrapper controls that you can use directly. Mentioned were WebView, MediaPlayer, InkCanvas, InkToolBar, Map and SwapChainPanel (for DirectX content). There will be a few compromises. The XAML host window will be rectangular (based on an HWND) which means non-rectangular and transparent content will not work correctly. There is also the Windows 7 problem: no UWP on Windows 7, so what happens to your XAML Islands? They will not run, though Microsoft is working on a mechanism that lets your application substitute compatible Windows 7 content rather than crashing. MSIX deployment. MSIX is Microsoft’s latest deployment technology. It will work with both UWP and Desktop applications, will support Windows 7 and 10, will provide for auto-updates, and will have tooling built into Visual Studio, as well as a packager for both your own and third-party applications. Applications installed with MSIX are managed and updated by Windows, have tamper protection, and are installed per-user. It seems to build upon the Desktop Bridge concept, the aim being to make Windows more manageable in the Enterprise as well as safer for all users, if Microsoft can get widespread adoption. The packaging format will also work on Android, Mac and Linux and you can check out the SDK here. Will WPF or WinForms be updated? That said, I also heard that the team would rather write code once and use it across UWP, WPF and WinForms via XAML Islands, than write new controls for each framework. That makes sense, the difficulty being Windows 7. Microsoft would rather promote migration to Windows 10, than write new UI components that work across both Windows 7 and Windows 10. 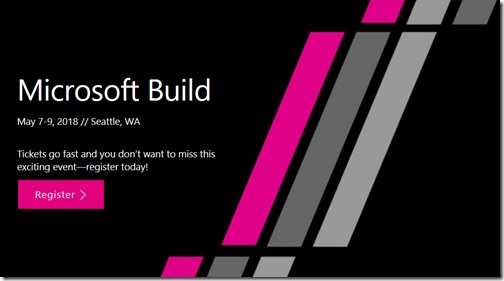 Should you go to Microsoft Build? In the beginning there was the Professional Developers Conference (PDC) – the first was in 1992. They were fantastic events, with deep dives into the innards of Windows and how to develop applications on Microsoft’s platform. Much of the technology presented was in early preview and often did not work quite right; some things that were presented never made it to production, famous examples including “Hailstorm” also known as .NET My Services, and the WinFS file system originally slated for Windows Vista. These events seemed to be a critical part of Microsoft’s development cycle. Internally teams would ready their latest stuff for a PDC session, which was then adapted and re-presented at other events around the world. Then PDC kind-of morphed into Microsoft Build, the first of which took place in September 2011. Unlike PDC, Build was specifically focused on Windows, and was originally associated with Windows 8 and its new app platform, WinRT. Part of the vision behind Windows 8 was that it would have a strong app ecosystem and Build was about enthusing and informing developers about the possibilities. As it turned out, the Windows 8 app ecosystem was a bit of a disaster for various reasons. 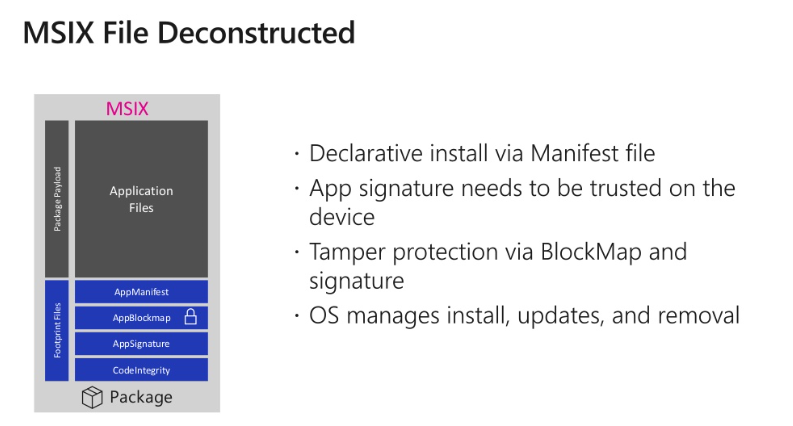 Microsoft had another go with UWP (Universal Windows Platform) in Windows 10. Build in April 2015 was an amazing event, where the company appeared to be going all-out to make UWP on both desktop and mobile a success. Not only was the platform itself being enhanced, but we also got Project Centennial (deliver desktop applications via the Store), Project Astoria (compile Android apps to UWP) and Project Islandwood (compile iOS code for UWP). Just a few months later the company made a huge about-turn. CEO Satya Nadella’s Aligning Engineering to Strategy memo signalled the beginning of the end for Windows Phone, and the departure of Stephen Elop and the dismantling of the Nokia devices acquisition. That was the end of the universal part of UWP. Project Astoria was scrapped. The Windows Bridge for iOS (Project Islandwood) still just about exists, but its core rationale (get iOS apps to Windows Phone) is now irrelevant. Nadella steered the company instead towards “the intelligent cloud” and to date that strategy has been successful, with impressive growth for Office 365 and Microsoft Azure. 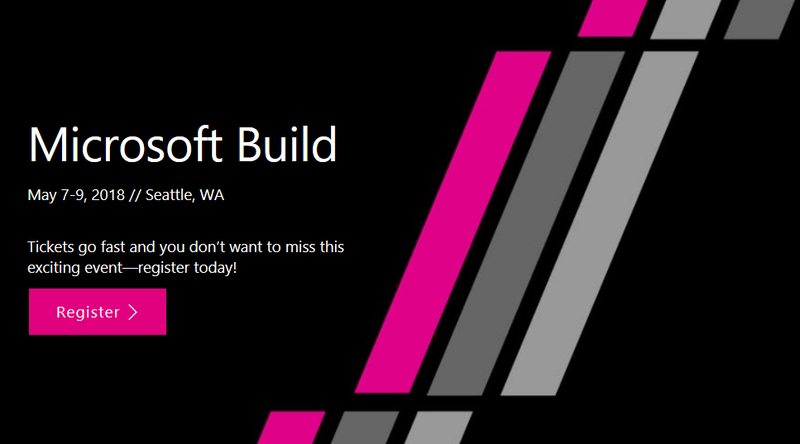 Microsoft Build 2018, Seattle, WA May 7-9, 2018. Microsoft’s ultimate developer conference focused on cloud, artificial intelligence, mixed reality, and more. That sounds like a focus on Azure and AI/ML/IoT/Big Data cloud services, and on mobile and IoT devices. It is a long way removed from the original concept of Build as all about Windows and its application platform. Windows remains important to Microsoft, and to all of us who use it day to day. Still, if you think about cutting-edge software development today, Windows desktop applications are probably not the first thing to come to mind, nor UWP for that matter. This being the case, it does make sense for the company to focus on its cloud services at Build, and on diverse mobile platforms through what is now an amazing range of cross-platform tools in Visual Studio. Of course there will in fact also be Windows stuff at Build, including Windows and HoloLens Mixed Reality, Cortana skills and UWP improvements. Still, if you can only get to one big Microsoft event in the year, Ignite in September is now a bigger deal and closer to the heart of the new (or current) Microsoft. Let me add that these Microsoft events, whether Build or PDC, have on occasion seen some stunning announcements. Examples include the unveiling of C# and the .NET Framework, the 2003 Longhorn reveal (yes it all turned to dust), Windows 7 in 2008, and Windows 8 in 2011. I would like to think that the company still has the capacity to surprise and amaze us; but it must be admitted that the current Build pitch is rather unexciting. Google I/O, incidentally, is on at the same time. 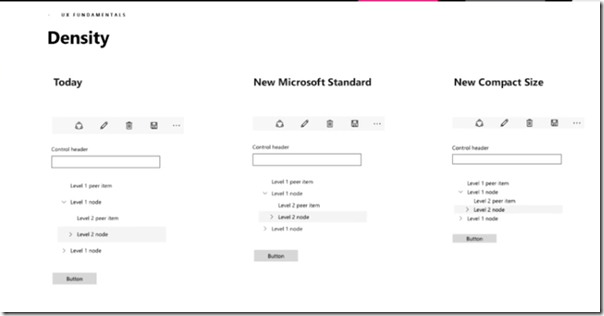 Microsoft is introducing a new feedback system for https://docs.microsoft.com, used for its technical documentation. The new system, which you can already see for certain topics such as the Visual Studio IDE, is based on GitHub issues. When you leave a comment, you can specify whether it concerns documentation or product functionality. The statement “Old comments will not be carried over. If content within a comment thread is important to you, please save a copy.” is unhelpful. Nobody knows what comments will be useful to them in future. As much I like the new system idea, I hate the fact that this is happening over and over. It used to be a Disqus comment system, then moved to LiveFyre, then moved now to this new system, what will be the next? The worst part of this all is that MS does not care about past content lost on these discussions, so many times I found issues described in the docs that are gone now. Please, pay attention to your previous mistakes, don’t let the information be lost again, at lest import them as closed issue in the new system. Sometimes progress has a cost and that is understood. However it is not impossible to migrate content from one system to another. It just takes effort. There is a lot of garbage, spam and even dangerous content within existing LiveFyre comments which would violate GitHub terms of usage and our open source code of conduct, as well as cause security problems. For legal and privacy reasons, we cannot move user-associated data from one system to another without consent from users (GDPR). LiveFyre conversations are threaded, while GitHub issues are not. Placing the old comments into the GitHub Issues system would derail the entire GitHub Issues workflow for both customers and employees and muddle the data. We would take the comments from an article on docs.microsoft.com and then convert them into a Markdown file. During this process, we would strip all user info (remember GDPR). The Markdown file would then be committed to a GitHub repo. Finally, at the bottom of the feedback section, next to the link that says "View on GitHub" we would add a second link that said something like "View Comment Archive". This link would connect you directly to the Markdown comment file for that page. This sounds positive. At the same time, it is a mess that illustrates some of the disadvantages of a “best of breed” approach to solving technical problems. If Microsoft could use its own technology to host a documentation and commenting system, and a source code management and issue tracking system for that matter, this issue would not occur, and users would not need multiple accounts, causing the legal issues mentioned above. Microsoft in fact used to use its own platform for all the above but decided to shift to using third-party solutions because they worked better. That seemed to be a good thing, improving user experience and productivity, but becomes a problem when what seems to be the best third-party option changes. Silverlight, Microsoft’s browser plug-in which included a cut-down .NET runtime, once seemed full of promise for developers looking for an end-to-end .NET solution, cross-platform on Windows and Mac, and with support for “out of browser” applications for a native-like experience. Silverlight was killed by various factors, including the industry’s rejection of old-style browser plug-ins, and warring factions at Microsoft which resulted in Silverlight on Windows Phone, but not on Windows 8. The Windows 8 model won, with what became the Universal Windows Platform (UWP) in Windows 10, but this is quite a different thing with no cross-platform support. Or there is Xamarin which is cross-platform .NET, and one day perhaps Microsoft will figure out what to do about having both UWP and Xamarin. Yesterday though Microsoft announced (though it was already known to those paying attention) Blazor, an experimental project for hosting the .NET Runtime in the browser via WebAssembly. The name derives from “Browser + Razor”, Razor being the syntax used by ASP.NET to combine HTML and C# in a web application. C# in Razor executes on the server, whereas in Blazor it executes on the client. Blazor is enabled by work the Xamarin team has done to compile the Mono runtime to WebAssembly. Although this sounds like a relatively large download, the team is hoping that a combination of smart linking (to strip out unnecessary code in both applications and the runtime) with caching and HTTP compression will make this acceptable. 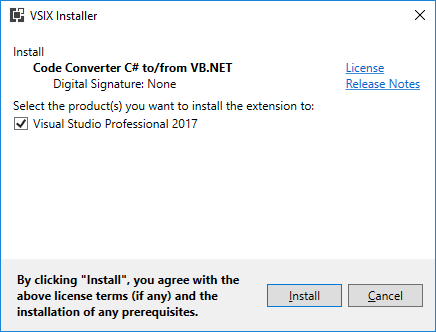 What version of .NET will be supported? This is where it gets messy. Sanderson says Blazor will support .NET Standard 2.0 or higher, but not completely in the some functions will throw a PlatformNotSupported exception. The reason is that not all functions make sense in the context of a Blazor application. Blazor sounds promising, if developers can get past the though the demo application on Azure currently gives me a 403 error. So there is this video from NDC Oslo instead. The other question is whether Blazor has a future or will join Silverlight and other failed attempts to create a new application platform that works. Microsoft demands much patience from its .NET community.